Kakes' crafting: 4KCBWDAY2 - Day 2 of the knitting and crochet blog week! 4KCBWDAY2 - Day 2 of the knitting and crochet blog week! Today we are supposed to plan a mascot project. We don't have to do it (thankfully.. after all that buzzing I don't know when I'd fit it in) but we are supposed to take you through the process we use when planning a project. So, I'll plan to make a bee (since it has to be linked to our house mascot.. and I'm a little uninventive). 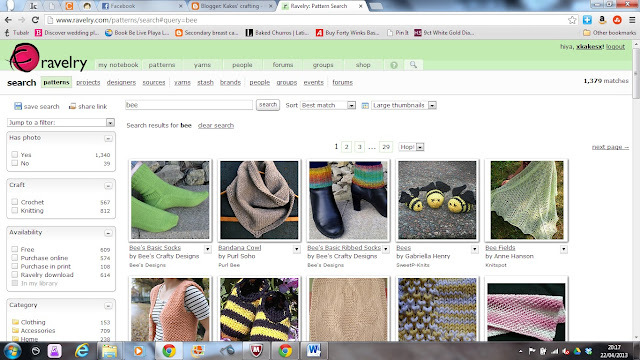 My first step would be to search for patterns related to the project I want to make. Perhaps on ravelry, or google. Immediately, I love the look of the little bees there, one in from the right. This project is knitting, so I would automatically think it would take some concentration for me (I'm still getting used to knitting again) and until last week, I wouldn't have been able to try it, as all my needles were too big! I have inherited some new to me needles though, so now have the right size! Next, I would probably completely ignore any yarn suggestions. I'm cheap and cheerful and rarely buy suggested yarn. I usually use acrylic, though I have some blended yarns too! I'd just make sure to pick some yarn colours that would work for the project, especially as it's a toy/plushie so it wouldn't need to be special yarn anyway.